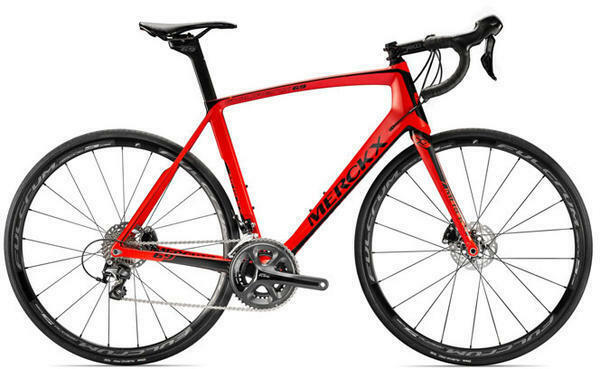 The Eddy Merckx Mourenx 69 105 Disc road bike is a lightweight, high-performance carbon fibre road bike designed for long days in the saddle. Mourenx 69 refers to Merckx winning the 17th stage of the 1969 Tour de France. This heroic 214.5km ride from Luchon to Mourenx provides the inspiration for a racing bike specially designed for long distances. With a perfect blend of rider-friendly geometry including a slightly higher head tube and shorter top tube the Mourenx includes a comfortable & compliant carbon layup in the seatstays that has been engineered to flex a little keeping you feeling fresher for longer while a super-stiff bottom bracket area ensures that all of your pedaling power transfers through to the rear wheel. The user-friendly technology doesn’t end with the frame though; the addition of predictable Shimano hydraulic braking takes the Mourenx 69 to another level providing you with confidence inspiring control even on steep, wet and unpredictable descents. The versatile Mourenx 69 includes thru axles for increased stiffness, enhanced steering and no disc rotor rub; it has clearance for up to 30mm wide road tyres allowing you to run larger, more comfortable tyres at lower pressures. With a capable, precise shifting Shimano 105 groupset and a pair of disc brake specific DT Swiss R24 Spline (or Fulcrum Racing 5) wheels the Eddy Merckx Mourenx 69 has been designed and built to cope with all of the demands of long distance events, letting you ride faster and further than ever have before. Just the job, large frame suits me better with handle bars not too low. Comfortable, good for climbing and also safe and stable down hill. A great looking bike. Smooth and steady. Really absorbs road vibration but is still stiff enough to be responsive. A little on the heavy side if you do a lot of steep climbing. Great deal and value. This is a truly great bike. Quality components. Although sold as an endurance bike it is still stiff enough to keep up on a club run. Comfortable to do some decent mileage. Looks far nicer than the pictures show it. Far better than many bikes around the same price point from other manufacturers. Beautiful frame and a very nice value for money.